Sony’s V series is the party essential you need this holiday season. With festivities and gatherings happening nonstop, Sony promises to power up your parties to a whole new level with its line-up of powerful one-box speakers. The Sony V series, “Party in a box”, has got you covered with its new compact design and high-powered audio system. 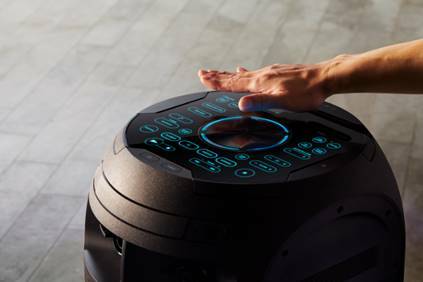 Having the Sony V series is like hiring a DJ and a band at the same time with its cool features -- DJ gesture control, mic and guitar inputs, and its latest TAIKO mode that adds drumming into the mix. Bringing you a perfect combination of 360˚ LIVE SOUND and 360˚ party lights for that perfect club atmosphere at the comforts of your own space. Take charge of the party. Queue in your favorite tracks and put your own spin to the music with the DJ gesture control. This interactive and fun feature allows you to play with DJ sound effects, samplers, and karaoke features. You can also easily skip tracks by just flicking your hand left or right, and up or down to manage the volume. Be your own DJ and set the perfect mood for your party. Who doesn’t love a good karaoke jamming? Keep your guests entertained and belt out lyrics from your guilty pleasure playlist; even better, take advantage of the two-mic inputs, hand the other microphone to your best friend and sing your favorite songs from high school. Connect a guitar to one of the inputs and you’ve got a guitar amplifier – that should make you feel like a rockstar. Enjoy three modes: Clean for a clear sound, Overdrive for a distorted guitar sound, and Bass for your bass guitar.